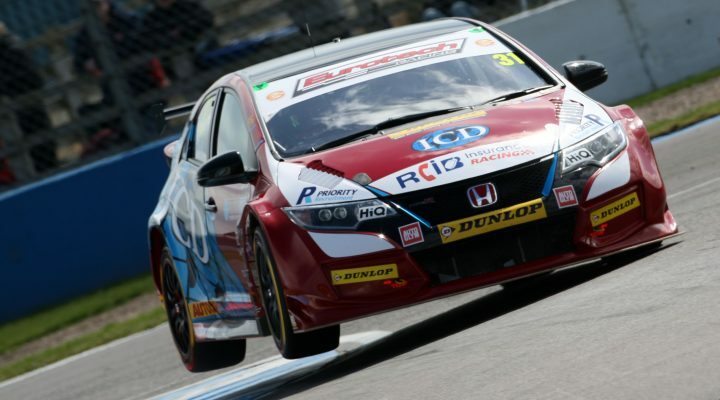 Eurotech’s Jack Goff’s topped the second Dunlop MSA British Touring Car Championship free practice session at Donington Park, which saw the top four drivers blanketed by just 0.040s and the leading 24 cars covered by less than a second. The Civic Type R pipped Jake Hill’s VW, Tom Ingram’s Toyota and Matt Neal’s Honda respectively, in an extremely close and competitve 40-minutes of running. Goff’s lap time has already eclipsed Ingram’s pace-setting effort in official pre-season testing, suggesting we could be in for a pulsating qualifying session later this afternoon. “I’m a lot happier now I’m out of the car and I’ve seen the time!” said Goff. “We had a bit of cross-communication on the radio and I thought I was four-tenths off the pace! It’s looking okay. The car isn’t perfect yet but I’m confident in the Eurotech Racing guys and in the Honda Civic Type R, so hopefully we can go and take it to the top guys in qualifying. FP1 front man Rob Austin seemed on course to make it two out of two, but the Handy Motorsport had to settle for fifth when the chequered flag fell. Michael Epps confirmed the pace of the VWs by joining stablemate Hill inside the top six. Halfords Yuasa Racing completed its own encouraging practice programme as reigning champion Gordon Shedden claimed seventh with maximum success ballast on board. The unpredictable nature of the BTCC was further cemented as Chris Smiley, Aiden Moffat and Ollie Jackson rounded out the top ten. Smiley and his BTC Norlin Racing team-mate Dave Newsham have made a solid start to life in the BTCC, whilst Laser Tools Racing’s Aiden Moffat is looking to bounce back from a rather lacklustre opening event at Brands Hatch. AmDTuning.com – running two Audis in the BTCC for the first time this year – will be pleased to see Jackson breaking into the leading order, as he and rookie team-mate Ant Whorton-Eales continue to develop the Essex team’s pair of striking S3s.